These are some shorts from the final day. 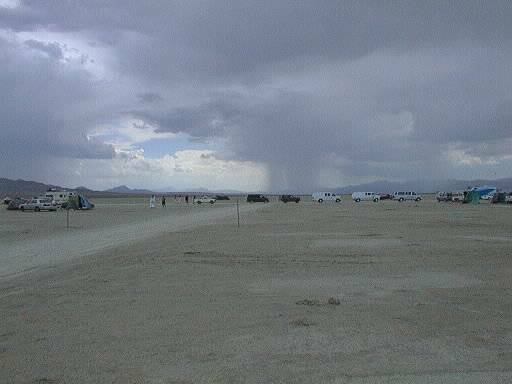 People pack up quickly, as many have a long drive. If you don't leave right away you will also get caught in the lines to leave. There need to be lines or there would be tremendous dust and tremendous traffic jams. Everybody's well behaved. I went out to the Man to take this small shot of what was left of him. The man burns, and so does the base he's on, which is built of wood and hay. In the past, the remnants of the man, and other burning structures, were the hardest thing for the volunteer cleanup crews to remove. They have a daunting task. 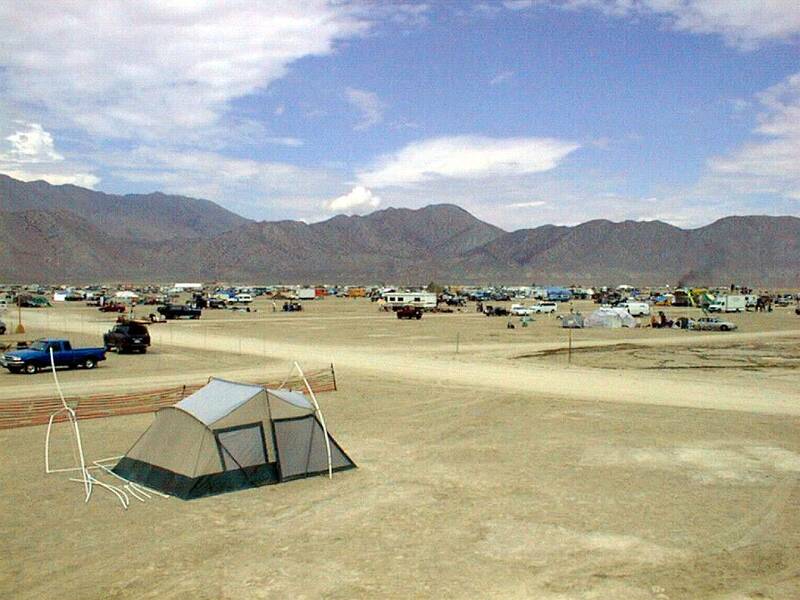 The goal is to "leave no trace" and in past years the government staff have been highly impressed (as am I) that they were able to go to the former site of the Black Rock City and not be able to figure out exactly where it was. 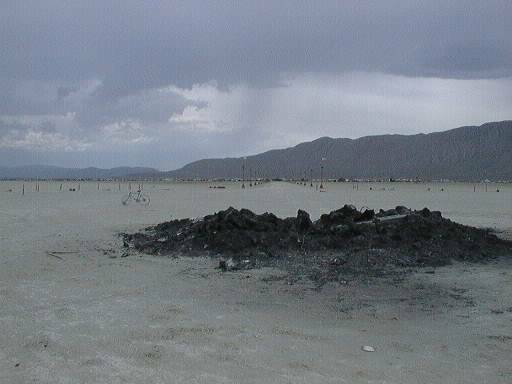 Under a very hot burn, the desert fuses, and has to be dug and pounded. Otherwise the task is mostly getting the garbage inconsiderate people left behind. Family Radio Service (FRS) is a new band that has generated high-quality walkie talkies. THey can go almost 2 miles over flat terrain. They offer 14 channels and 38 sub-codes within each channel so you can use them without hearing other people. It's a really great way to coordinate with your friends, since BM has no other communication network, and it can be close to impossible to find people with the size of the festival. I also found some people were using the channels without the sub-codes, to deliberately be able to interact with other groups. It was one way to meet people. Of course HAM bands and Business band 2 way radios are also great, plus CB and other 2-way radios. Low level walkie talkies are also fine over a shorter range. 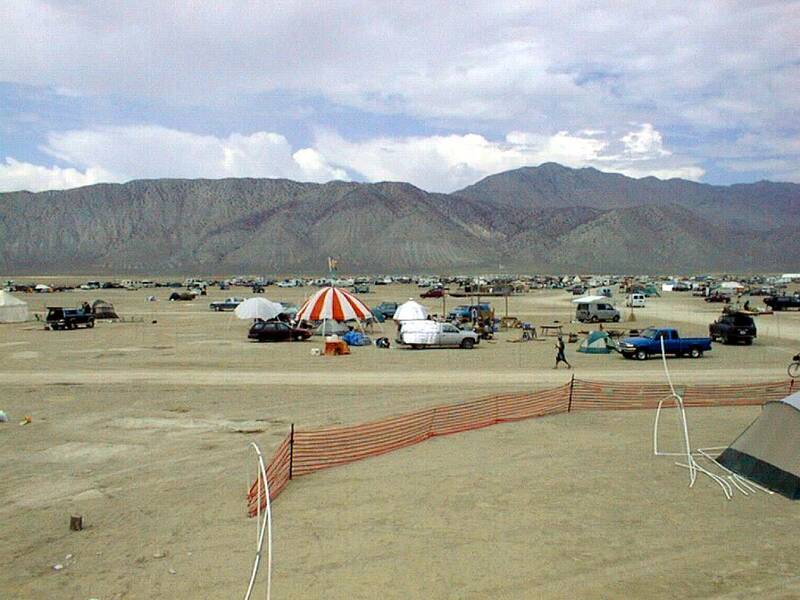 No doubt some day a cell company will put a free (for the publicity) temporary cell up in Black Rock City, not to reach the outside world, which would ruin the isolation, but to reach other people in the city. Bring 'em. 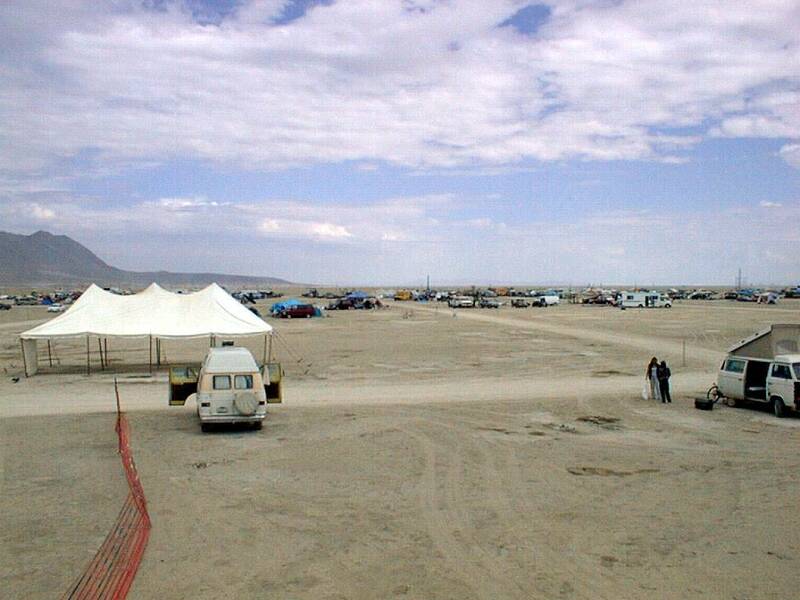 I'm sure that playa dust is not great to breathe, and you will get plenty in the dust storms. People would stand in their camps squirting anybody who walked or biked by. Instead of being annoyed, 99% of people said "thank you." They already tell you to bring lots of water. You can always use extra for a well needed shower, or give it to the cleanup crew. And always have a water bottle or backback water container on hand. I would fill mine with 2 liters and ice and drink it all in an afternoon. Don't go without a bike. Mountain bike is best, hybrid is fine, even road bike will work. Decorate your bike. Bring lots. At night, aside from decorating yourself, it also makes it easier for your friends to find you.